How can you know who is downloading your images and from where? How can you control who downloads your images in the first place? Do private registries on Docker Hub give you the fine-grained access control that you really need? And while Docker is great – life as an organization developing software does go beyond Docker. What do you do with all the other software technologies you want to distribute? Do you need a different solution for those? Bintray goes beyond organizations and teams. Using entitlements and download keys, Bintray also gives you a way to provide access to external users with a granularity ranging from complete repositories down to specific file paths. Detailed stats and logs can show you much more than just how many times an image has been downloaded. Get details of who is downloading and from where – even as a live feed. Bintray is much more than a hub for Docker images; it is a hub for all software components. Using Bintray you can simplify your life (and download scripts) with a single download center that can handle distribution of all your software packages. 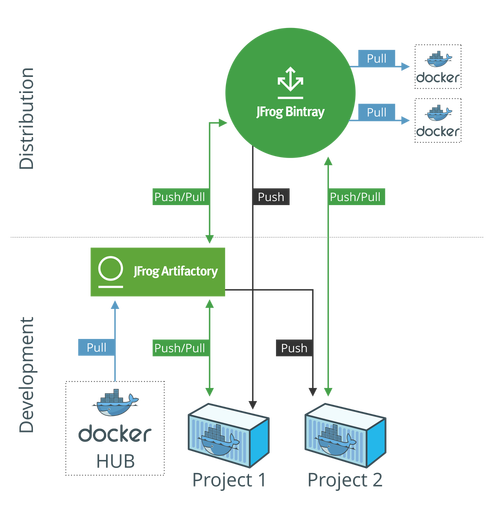 Software distribution is a core competency at JFrog, with Bintray serving over 200 million packages per month with rapid CDN downloads, privacy and security and integration with any build ecosystem for fully automated software distribution. As a download center for Docker images, Bintray takes an organization several steps beyond what Docker Hub can offer. With distribution as a core competency, Bintray offers more advanced security, more detailed stats and logs and wide-ranging support as a download center for every packaging system in common use today.